American families are eating out more than ever, but aren’t always making the healthiest choices. Tufts researchers are working with restaurants and parents to change that. It was around 1 p.m. at a fast-food restaurant in Somerville, Massachusetts, and Chris DeFilippo was trying to get her two-year-old granddaughter to eat from her own plate. Aylah was more interested in the french fries they were sharing. Like many, DeFilippo worries about what her grandchildren eat at fast-food restaurants, what they don’t, and how much it all costs. “You worry about all of it,” she said. Christina Economos, NG96, professor and New Balance Chair in Childhood Nutrition at the Friedman School, is familiar with these worries. As childhood obesity researchers, she and her colleagues have interviewed thousands of parents who want their children to be healthy eaters, but the convenience, low cost, and palatability of child-pleasing foods are a big draw. But rather than demonize the restaurant industry, Tufts researchers are working with it to increase healthier options on menus. Their work, funded by the JPB Foundation, with additional support from the Robert Wood Johnson Foundation, is one of several research-into-action initiatives spearheaded by ChildObesity180, a multi-sector collaboration based at Tufts aimed at turning around the epidemic. “Our approach has always been to invite all players to the table to find solutions,” said Economos, who is vice chair and director of ChildhoodObesity180, which has reached more than 11 million children in all 50 states since its founding in 2009. Fast-food chains have come under fire for their advertisements to children, and now research has put a number on just how effective that marketing can be. 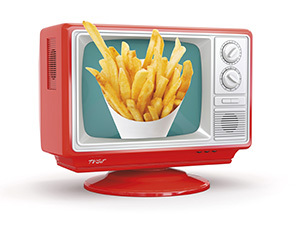 Preschoolers who saw a moderate to high number of child-targeted TV ads increased their likelihood of consuming the fast food by about 30 percent, according to a study by Madeline Dalton, N85, NG94, professor of pediatrics at Dartmouth’s Geisel School of Medicine. Dalton surveyed about 550 parents about the channels their children watched and how much fast food from Subway, McDonald’s, and Wendy’s they had eaten in the past week. The researchers then cross-referenced the data with a list of fast-food commercials from those restaurants that had aired over that time. The association was independent of socioeconomic status, how often their parents ate fast food, and other factors. Thanks to the team’s collaborations with businesses—and long track record of success—ChildObesity180 researchers have been able to conduct groundbreaking studies right inside restaurants, gaining unprecedented access to sales data and measurements of what kids are actually eating. What they’re finding is that offering healthier foods can be good not just for children—it can be good for revenue, too. 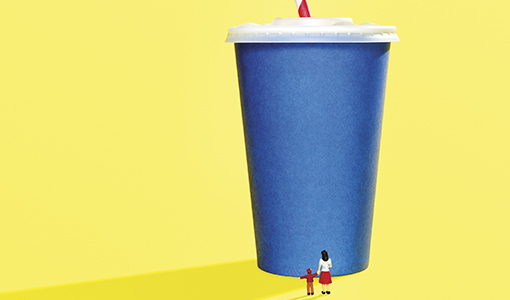 Now, they’re taking their work to the other side of the restaurant counter: Figuring out how to help caregivers like Chris DeFilippo make healthier decisions when they place their orders. 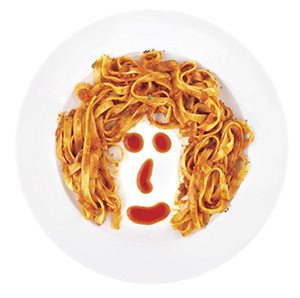 IN APRIL 2012, THE SILVER DINER, a chain of more than a dozen family restaurants in Virginia, Maryland, and New Jersey, decided to change its kids’ menu. In addition to adding some healthier entrees, such as teriyaki salmon, it took fries, sodas, and other sugary drinks off its list of kids’ sides and extras. Parents could still order them for no extra charge, but they were no longer the default. It was a bold decision by the company, and one Economos and other Tufts researchers noticed. Working with the Silver Diner in 2014, Tufts looked at sales data from about 350,000 children’s meals before and after the changes. The results were better than anyone could have expected. On the original menu, just 3 percent of kids’ entrée orders were from healthier options—after the changes, nearly 50 percent were healthier. Orders of french fries dropped from 57 percent to 22 percent, and orders of strawberries jumped from 29 percent to 63 percent. When the researchers followed up two years later, the orders of the healthier items remained just as high. And just as important, revenue at the chain continued to increase. Working with restaurants has been important to Economos ever since her groundbreaking efforts on the Shape–Up Somerville project nearly 15 years ago. That initiative, which continues today, helped to slow childhood obesity in one urban community by tackling it from all sides, including improving school lunches and making it easier for kids to walk around the city. But a key component was encouraging local restaurants to become “Shape-Up approved” by meeting certain nutritional criteria. Eventually, the team convinced restaurants to sign on, but business owners were initially concerned that changing their menus might hurt profits. That’s one reason the Silver Diner experience was so encouraging. “The business case was extremely important,” Economos said, to prove that healthier items and achieving business goals weren’t mutually exclusive. Over the past 15 years or so, some restaurants have been making strides. McDonald’s, for example, added apple slices to its menu in 2004, driving annual sales of apples meant for slicing from 132 million that year to more than 506 million by 2015. It also took soda off the Happy Meal section of its menu board, and now offers only milk, water, and 100-percent juice; it announced it will add a lower-sugar juice this year. Since 2013, it has offered a smaller kids-sized fry and added low-fat yogurt as an option in 2014. When it comes to calories, “nonchain restaurants can be just as bad as chain restaurants,” said Susan B. Roberts, director of the Energy Metabolism Laboratory at the Jean Mayer USDA Human Nutrition Research Center on Aging (HNRCA) at Tufts. Her lab looked at independent restaurants around Boston, San Francisco and Little Rock, Arkansas, that served a range of cuisines, including Greek and Italian. An entrée with side dishes at these restaurants still averaged about 1,200 calories, a surprising 49-percent higher than the calories of the most popular meals at the most popular restaurants nationwide—and about half of the daily energy requirement for adults in a single meal. Restaurants are clearly interested in kids and nutrition. When the National Restaurant Association surveyed 1,300 professional chefs for its What’s Hot 2017 Culinary Forecast, “healthful kids’ meals” ranked third out of 119 food trends. But there remains a lot of room for improvement. A 2016 Tufts study looked at kids’ meals at the top 20 restaurants with kids’ menus. Most of the meals did pretty well on calories, but many exceeded national recommendations for fat, saturated fat, and sodium. Economos said that restaurants are changing for the right reasons— they see an obligation to the next generation. Still, in talking to restaurant owners and industry leaders, she heard one thing over and over: Customers need to order it for us to continue to keep it on the menu. “We decided to continue our work on supply and pushing that behind the scenes,” Economos said, “while moving toward a demand campaign as well.” That meant bringing their messages right to parents. When the ChildObesity180 researchers started thinking about what a campaign to sway moms would look like back in 2013, Harelick figured they would be educating them about calories, especially with new menu labeling rules on the way. A review of the research on labeling, co-written by Economos, predicted mixed results, though: Labels reduced the calories people purchased in some settings and among some customers, but had little effect in typical fast-food restaurants. And when they started talking to moms in focus groups in 2015, in an effort to meet consumers where they are, the researchers realized that asking them to count calories wasn’t going to work. Few parents have the time and inclination to add up calories before placing an order inside a restaurant, Harelick said. “They are certainly not going to be looking at calorie counts on the drive-through menu.” What they heard instead was that fast food takes away some of the stresses moms face. “It’s convenient, fast, inexpensive, makes their kids happy; it fills them up,” Harelick said. In some communities, eating out is cheaper than shopping and cooking at home. 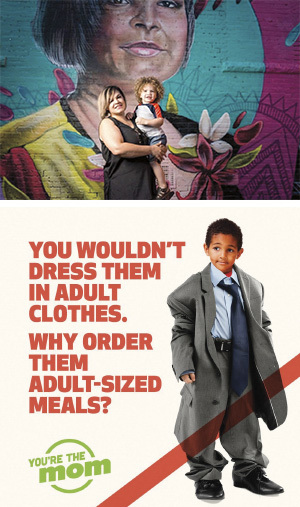 A mural and ad from the You’re the Mom campaign. Erin Hennessy, J99, N03, MG03, NG10, a research assistant professor with ChildObesity180, has done extensive research on understanding how parents influence their children’s eating habits. Hennessy points to a large body of evidence on the benefits of being what experts call an authoritative parent: “Someone who is responsive to their child’s needs, hears their child, reasons with their child, negotiates, but also has expectations and demands and rules,” Hennessy said. “And we know that that type of parenting style is associated with the most positive child health outcomes,” including eating habits. However, in today’s 24-hour, all-access food environment, there are many challenges and obstacles that parents face. Taken together, the researchers knew that to be able to create an effective public health campaign, messages had to be about empowering mothers to set some boundaries, while also providing choices. It had to be inspiring, motivating, fun, and celebratory. And it had to offer a number of small changes that, taken together, could make a big difference. THE RESULT OF THE TUFTS research was “You’re the Mom,” a public health campaign aimed at moms of five- to ten-year-olds. They chose to test it in Springfield, Massachusetts, a city where nearly 1 in 3 of 154,000 residents live in poverty. This is a problem, because even as restaurants try to improve children’s options, they aren’t really reworking their core products. A 2015 study led by Alice H. Lichtenstein, director of the Cardiovascular Nutrition Laboratory at the HNRCA, showed that the portion size, calorie count, and sodium content of the most popular items at three major fast-food chains basically hadn’t changed since 1996. Over those years, calories in a large cheeseburger meal with fries and a regular cola ranged from 1,144 to 1,757 among the chains. That’s as much as 110 percent of the 1,600 calories a moderately active eight-year-old needs in a day. The Tufts researchers then set out to see what parents thought of the campaign and whether it affected what parents ordered and kids ate. In a research coup, they managed to get permission from a large, well-known restaurant chain—one with a name they can’t disclose—to interview patrons. Three days a week for four months the Tufts team watched families order food and then approached them with questions. “For a gift card,” they asked, “would you give us your receipt and fill out a survey?” And after that, they moved in for the kicker: Could the researchers take the leftovers back to the lab? Despite some surprised looks, they managed to get thousands of people to take part. Back in Boston, the researchers analyzed each family’s half-eaten hamburgers and remaining french fries to determine how many calories the kids were consuming. The researchers had used the same method in a pilot study that found kids at four fast-food restaurants ate an average of 519 calories per meal. They also consumed fewer calories, sodium, and sugar when they ordered off the kids’ menu. THE TUFTS TEAM HOPES the “You’re the Mom” campaign will catch on nationwide. After the Springfield project ended, they collected the advertising materials and put together a free digital “toolkit” for other communities to use (available at childobesity180.org/yourethemom.) They’ve already had interest from about forty other organizations across the country. Contact Julie Flaherty at julie.flaherty@tufts.edu. 1. For children ages five to twelve, how many calories should a meal contain? 2. How many calories do you save ordering a grilled chicken sandwich instead of fried? 3.About how many teaspoons of sugar are in a medium Coca-Cola at Burger King? 4.Swapping apple bites for fries in a Wendy’s kids’ meal will save how many calories? 5.Which McDonald’s dessert has the fewest calories? 1. (b) In a survey conducted by Tufts researchers, two-thirds of parents over- or underestimated the number of calories kids need at a meal. 2. (c) The chicken in McDonald’s Artisan Grilled Chicken Sandwich has 130 calories, versus 300 in the Buttermilk Crispy Chicken Sandwich. Include the roll and mayonnaise dressing, and the latter totals 560 calories. 3. (c) That’s more than three times the maximum added sugar the American Heart Association recommends children should have in a day. 4. (c) A value-size fry has 230 calories, versus 35 for the apples. 5. (a) The kiddie cone has only 45 calories, the cookie has 170, and the shake packs in 500. How climate change will affect agriculture and nutrition. Working in three very different places, certificate graduates are finding smart ways to make their communities healthier. They wanted to do something good for the world. It became the foundation for a career. Can what you eat change your gut microbiome? Can a strategy from the business world help solve public health problems? Teaching kids to make better snack choices with their own pocket money. A common infection is linked to Alzheimer's and other neurodegenerative diseases.